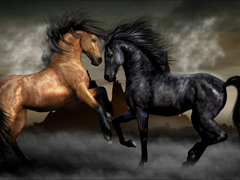 Jigsaw puzzle N52: Horse tango. Free online jigsaw puzzles. A man met his tailor in the street and stopped him. "I quite forgot to pay for the suit which I have on now," he said. "Why didn"t you remind me?" "I never ask a gentleman for money," the tailor replied. "Then what do you do if he doesn"t pay?" "Well, after some time I no longer think he is a gentleman and then I ask him." An ostrich"s eye is bigger than its brain.